As policymakers continue to debate the incentive effects of tax changes, recent changes to the U.S. federal tax code produced another real-time experiment to test those incentive effects. Specifically, changes in 2017 capped the allowable deduction for state and local taxes at US$10,000 whereas no direct cap had existed in the earlier tax code. The consequence is an increase in the effective tax rate paid by residents of high-tax rate state and local jurisdictions such as New York City, Chicago and major cities in California, since many residents in those locations can no longer fully deduct state and local taxes against their federal tax liability. Resulting changes in behaviour to the 2017 cap are consistent with what proponents of supply-side economics predict. Namely, higher effective tax rates create incentives for taxpayers to incur costs to avoid paying higher taxes. In this case, the tax code change has apparently stimulated an exodus of people out of states such as New York, New Jersey and Illinois to states with lower or no income taxes, most notably Florida. It has also resulted in high tax states generating less tax revenue. New York Governor Andrew Cuomo blamed the state’s $2.3 billion budget deficit on the federal tax change that has driven some of the tax base out of the state. Arthur Laffer would not be surprised. So why is this experience relevant for Canadians? Primarily, it reinforces concerns that relatively high tax rates in Canada compared to the United States are diverting capital investments to the U.S. that would otherwise be made in Canada. In this regard, Canada might begin to enjoy a more competitive tax position if the Democrats gain control of the executive and legislative branches of government in the 2020 election. Democrats in Congress are falling over each other with proposals to raise taxes on the “rich.” The media’s current favourite, New York State Representative Alexandria Ocasio-Cortez (or AOC, pictured above), has called for a 70 per cent marginal tax rate on incomes over US$10 million. The current top marginal tax rate is 37 per cent. Senator Elizabeth Warren has proposed a 2 per cent tax on net wealth above US$50 million and an additional 3 per cent above US$1 billion. And Senator Bernie Sanders, nominally an Independent who typically votes with the Democrats, has argued for a tiered inheritance tax that would begin at 45 per cent on estates worth more than US$3.5 million and end at a 77 per cent rate on estates valued in excess of US$1 billion. Proponents of levelling income and wealth differences by taxing the rich claim there will be huge increases in tax revenues that could finance social and environmental programs. AOC says that her top marginal tax rate of 70 per cent will raise more than $700 billion over a decade. 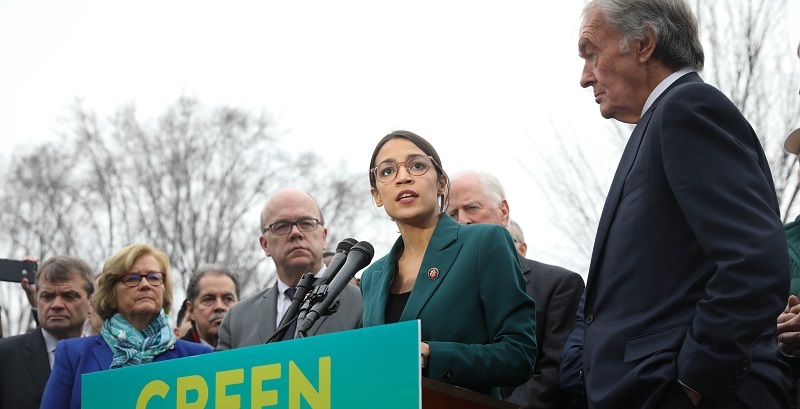 She wants to spend the increased revenues on a “Green New Deal” that would fully convert the U.S. economy to renewable energy. Senator Warren expects her wealth tax to raise about $2.75 trillion in 10 years. Conversely, the non-partisan Tax Foundation has done simulations showing AOC’s proposed tax change, applied to all income, would result in lower overall tax revenues due to a shrinking tax base. Supporters of these Democrat proposals point to surveys documenting strong support among American voters for higher taxes on the rich. For example, almost 60 per cent of respondents to a recent poll said they backed AOC’s proposal to raise the top marginal tax rate to 70 per cent. Senator Warren’s wealth tax proposal also receives broad support in polling. It’s not surprising that most respondents would answer in the affirmative when asked if they want the rich to pay more taxes. The problem, of course, is the question is grossly simplistic. A realistic question would ask if the respondents support higher marginal tax rates and wealth taxes if it generates only a small amount of additional revenue, at best, and primarily encourages talented individuals and entrepreneurs to spend their time and money avoiding paying more taxes at the expense of innovating and starting new businesses that employ more workers. On the bright side, Canada could benefit substantially from a “soak-the-rich” tax regime in Washington. While an exit tax on wealthy Americans might deter some successful entrepreneurs and investors from leaving the U.S. for Canada, talented individuals who have not yet accumulated substantial wealth might believe they’d be better off creating wealth for themselves (and for society) in Canada. Canadian policymakers may soon feel mounting public pressure to follow the lead of populist U.S. politicians such as AOC. Resisting such pressure would pay dividends for Canada’s economy.